Stay tuned for a MANDATORY wallet and Block DX update. If not updated to this upcoming wallet release, YOU WILL END UP ON A FORK. This update is undergoing final QA and will be released soon! In-app auto updater so users can easily check for updates and upgrade from within Block DX. Improved price chart with better active focus, a data legend, and volume bars. Orderbook revamp to display buy and sell orders as separate lists, new design for size indication bars, and a way to easily identify your own orders. Simplified order statuses replacing the API order states with user-friendly statuses. “My orders” revamp for “Active” and “Inactive” tabs with new order filtering, update order statuses indicators, ability to view the order status on hover, and a unified table structure so data is aligned when changing tabs. Depth chart update to fill the entire panel and reversed sell/buy sides to match with the orderbook. Market pricing settings screen updated to have CryptoCompare as the default price source, shorter default refresh frequency, and indications and error messaging to let a user know when an API key is and isn’t required. Bug fixes including correcting the market pair statistics data (information above the price chart) and correcting price chart data. UX improvements including updated datetime format, reorganization of columns, naming conventions, and text updates. 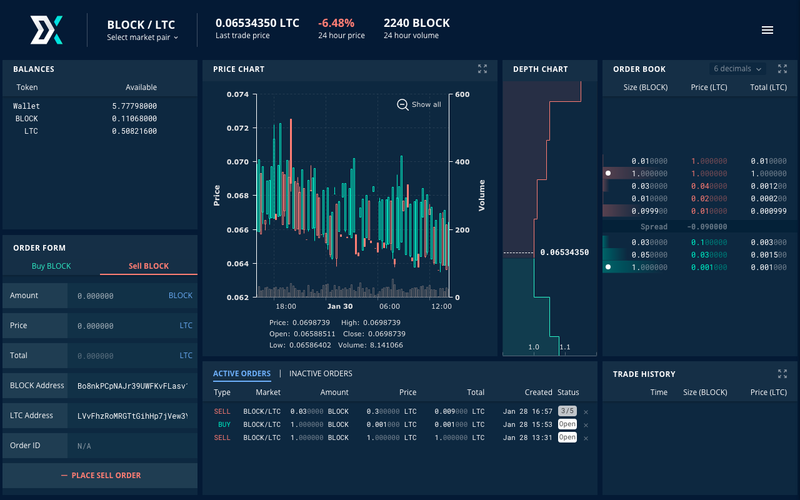 There are also a few more Block DX features in development including improved error messaging so the user has a better idea of what’s wrong when an issue occurs, an informational screen to help onboard new users, and a revamped depth chart. We have created and moved on to Testnet 5. The change in Superblock amount has been successfully tested on testnet and the available Superblock amount has been changed to 40k BLOCK on mainnet and 20k tBLOCK on testnet. Improve Service Node list stability including: 1) Newly started Service Nodes only need to wait 135 minutes to enter the queue instead of 20 hours, 2) Service node vin must have confirmations in excess of total number of Service Nodes on the network 3) Recently started Service Nodes are no longer part of the ranking. Trade locktime drifts have been improved. A check has been added to make sure Service Nodes have seen the order before processing. Orders are now put in rollback state if redeem is required. Fixed getbalance RPC crash on account alias, remote activation, dxLoadXBridgeConf bug, state verification and fee checks, and order cancellation checks. Check out a preview of the new trading screen above. Following these releases, a large marketing push including articles, how to videos, planned grassroot initiatives, a relaunch of Coin Announcements and collaboration with previously announced projects will begin. This will be accompanied by market makers to increase liquidity on Block DX and BLOCK airdrops so new users can begin trading right away. Block DX is the fastest, most secure, most reliable, most user-friendly, and most decentralized DEX. We’re eager to make the world aware of this. Project coordinator Hanni has recorded a podcast with Allen from Darc Network (formally Stake and Nodes) discussing all aspects of Blocknet. Check it out here. Blocknet will have a featured interview with Crypto Candor in the next issue of The Blockchain Brief, which is scheduled for release the day after tomorrow (February 1st) so be sure to check it out! Part 1 of the 51% report on interoperability has been released and Blocknet’s Arlyn Culwick has the leading quotation. This is an influential financial research publication and is taken seriously by professionals. Check it out here. The talk by Arlyn Culwick from the North American Blockchain Expo has been released! Check out this fascinating talk here and find how Blocknet’s interoperability protocol is removing the barriers of entry to the Internet of Blockchains via decentralized API’s to herald a new era of Interchain Services. Receive free BLOCK in the Blocknet Social media bounty campaign! Read more here. A new Blocknet forum is being created to host various information such as proposals, discussions, dApp ideas, and more! Blocknet’s documentation portal was recently released! Don’t forget to check it out. These resources will be undergoing progressive and iterative updates including additional content, video tutorials, written tutorials, and tools. This is part of an initiative to strengthen Blocknet’s image, help inform others about the project, and make resources more readily available. More about the plans for the documentation portal can be read in the #documentation channel in Discord. A new landing page has been added to Blockdx.co to welcome new visitors. The proposals for Superblock 777600 can now be viewed here. Voting will close on block 774720, but your node must remain active until block 777600 for your vote to count. In addition to this list, there are another 30 blockchains that are unannounced. 137 blockchains are in progress for error resolution + finalization. If you want to be the first see these updates, you can receive the newsletters directly to your email by subscribing here. Our next update is due on February 15th. Until then we look forward to hearing from you!